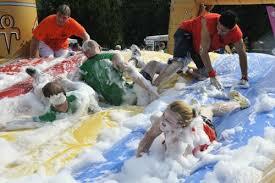 We are pleased to announce that It’s a Knockout will be returning on the 28th May. We all look forward to you joining us for the very special day. Alec’s Angels 7th It’s A Knockout Family Fun Day with this year being hosted by Graham Fisher. Its a knockout team competition starting in the morning. We are currently looking for teams of 6-10 people to compete in this competition. Minimum sponsorship is £300 per team. This works out at only £30 per person if you have a team of 10!! After the main competition there will be an opportunity for the kids 5-14 years to have a go at some of the obstacles for £5. Throughout the day there will be other entertainment available as well as food and refreshments.